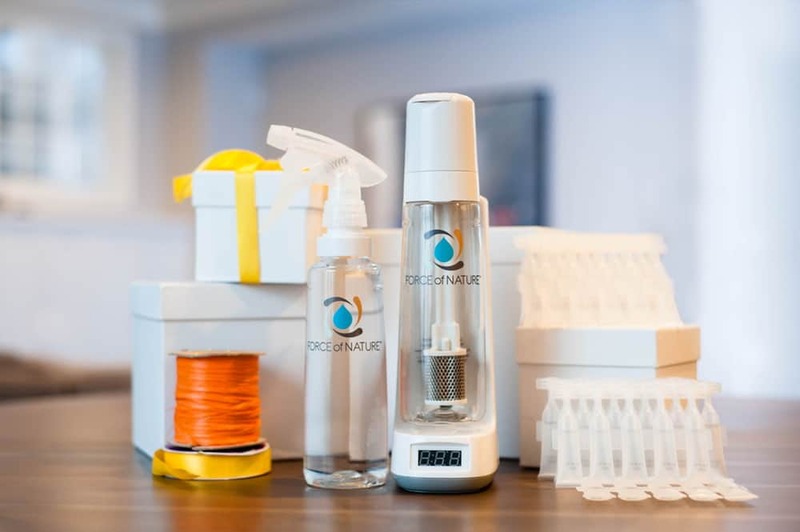 Each Force of Nature Capsule makes one 12 ounce bottle of multi-purpose cleaner & deodorizer that lasts 2 weeks. Light, clean scent and zero added fragrances. We promise you’ll love it or we’ll refund your money – satisfaction guaranteed. Each Force of Nature Capsule makes one 12 ounce bottle of all-purpose cleaner & deodorizer that lasts 2 weeks. Light, clean scent and no added fragrances. We promise you'll love it - 100% Happiness Guaranteed. With so many different ways to use Force of Nature, our 25 count Activator Capsules will keep you armed and ready for any mess. It works anywhere you need to eliminate odors, grease, grime, sticky messes or soap scum. Use it to replace multiple cleaning products with just one that can save you up to 80% on every ounce vs typical natural cleaners. Each capsule makes 12 ounces. 100% free of toxic chemicals yet the same cleaning power as bleach. No dyes, fragrances, preservatives, allergens, skin or respiratory irritants. Cleans soap scum as well as Scrubbing Bubbles with no harmful chemicals. Cost per ounce only 7¢. Can save money in the first year. Replaces bleach, deodorizers, kitchen, bath, glass & rug cleaners. 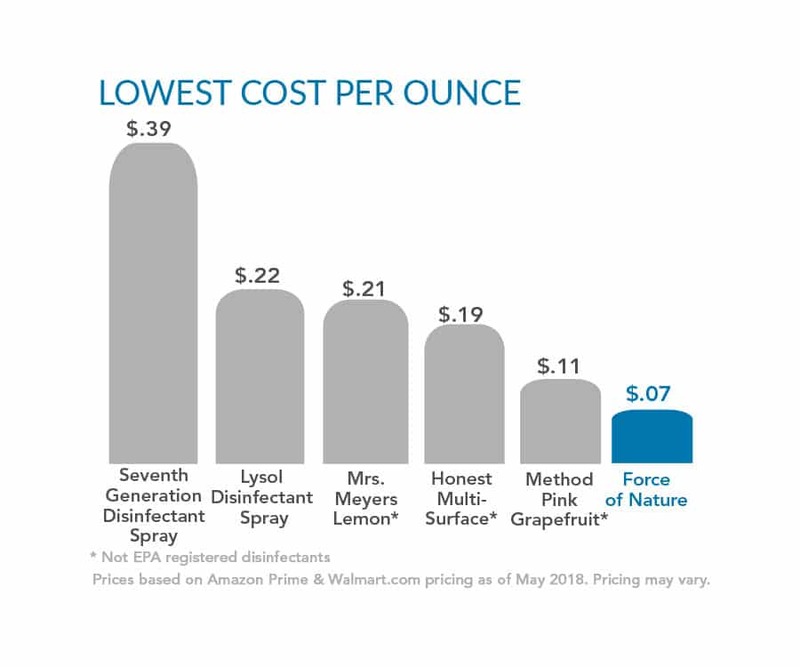 Many people don’t know that there’s no single definition of “natural” in cleaning products & that manufacturers aren’t required to list all their ingredients on their labels. Force of Nature starts with just salt, water & vinegar and uses none of these chemicals. Force of Nature is kid-simple to use. And with no toxic chemicals, your budding scientist can help you make it! Fill Force of Nature activator with tap water. Add 1 Force of Nature capsule, push the button, wait about 6 minutes. Q: Does it have a scent? 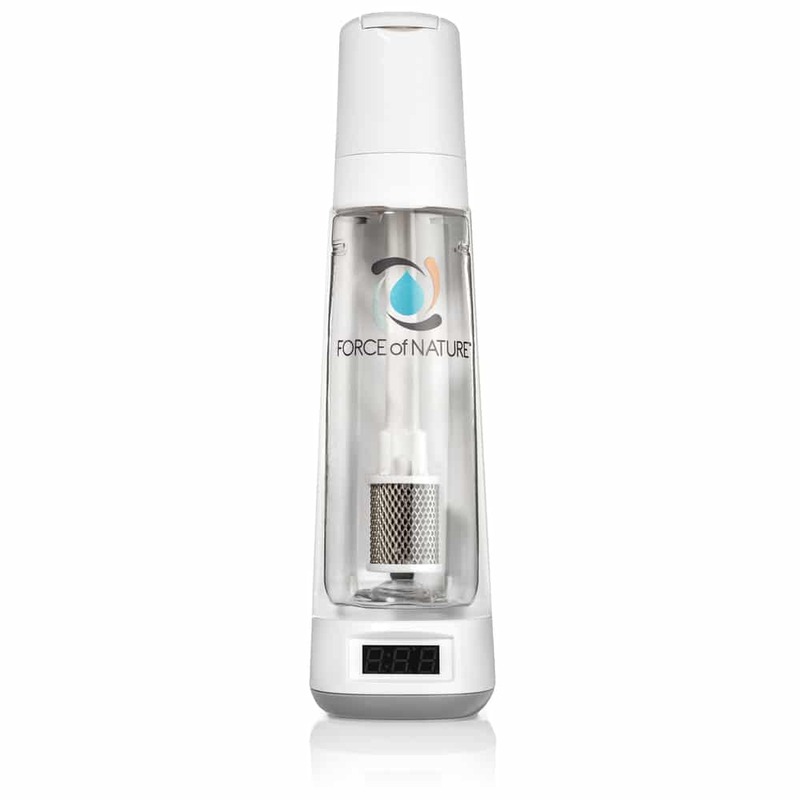 A: Force of Nature has zero added fragrances so it’s safe around family members with asthma and allergies. 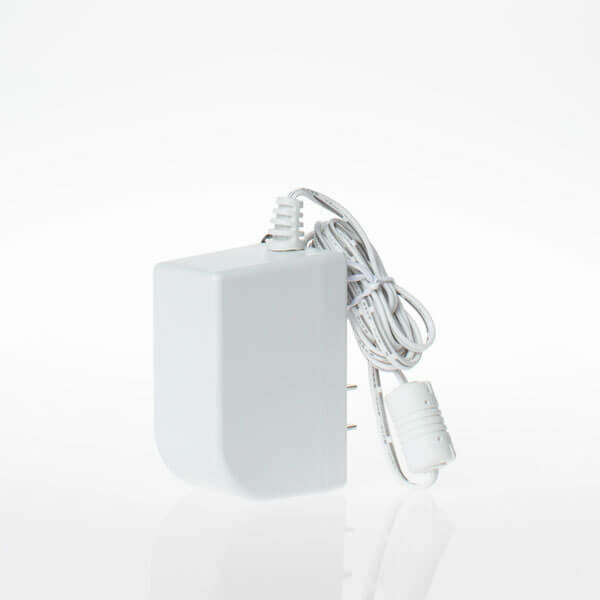 It has a light swimming pool scent that is naturally created when salt, water & vinegar are electrolyzed. The scent is from the active ingredient, hypochlorous acid, which is the same active ingredient commonly used in wound, eye & veterinary care products. Q: Why does the cleaner only last 2 weeks? A: Just like bubbles in a carbonated drink, hypochlorous acid starts to dissipate over time. 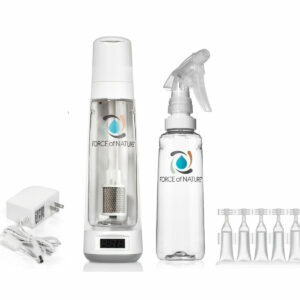 To be absolutely sure Force of Nature is at its optimal cleaning power, you should use it within 2 weeks. The bottle is 12 oz, vs a typical cleaner which is around 26-32 oz. Most families use about a bottle a week when they use it for all their all-purpose cleaning & deodorizing needs (replacing bleach, deodorizers, kitchen, bath & glass cleaners). Families who also use it on floors & rugs use even more. There is a date on the base that counts down the 14 days to remind you. Q: Does it work with hard water or well water? A: If you have hard or well water, you would need a water softener or bottled, filtered or distilled water instead of tap water. This is because the minerals in hard water interfere with the chemistry, making the cleaner less effective. Q: On what types of surfaces does it work? A: It’s safe & effective on virtually any surface – sealed stone counters like granite, marble & quartz, wood, laminate, stainless steel, glass, grout, tile, porcelain, plastic, rubber & even on high chair trays & cutting boards where it’s so safe there’s no need to rinse. It’s also safe & effective on kitty litter, pet toys & bedding. It’s great to use on washable fabrics, rugs, furniture, stuffed animals & clothing. Always test first for color fastness in an inconspicuous spot & let dry before proceeding and don’t use on fabrics labelled “only non-chlorine bleach”. Because Force of Nature has no whiteners like bleach or titanium, it won’t remove rust or hard water stains, or stains on grout. With soap scum, depending on build up & surface porosity, you may need a mild abrasive like baking soda with your scrub brush the first few times. This is because soap scum builds up in layers & can require a few applications to break down. So excited to find more and more uses for this product. Like everyone else – purchased to limit chemicals in my home and reduce waste from plastic cleaner bottles. I’ve been making my own cleaners with vinegar and other natural ingredients but worried about the disinfectant properties. I read some independent reviews before purchasing and was encouraged that lab tests proved its effectiveness. Love the idea that it gently cleans like bleach without the harsh fumes. It arrived so quickly. It has done a great job cleaning where I’ve used it so far. I can’t say how much I love this product! I love that it cleans everything safely. I love to be organized, so now I can clear out my cleaning cupboard. Dump those nasty chemical cleaners and feel happy knowing my house is extremely clean and oh so in order! I ordered this for my beautiful daughters who have babies – I want their homes to be organized, clean and safe for my amazing grandchildren. This is the best cleaning product I’ve ever used, I love it!!! This should be in everyone’s homes. I love this product, I want to clean everything in sight. My 13 month old son loves to help me clean and wipe down after I spray and to know that this product is truly non toxic makes my heart smile. I bought this kit for my sister, who is very particular as to what she uses to clean. I finally got the kit to her but haven’t heard as to how she likes it. I have no doubt she will be thankful to always have cleaning product on hand. 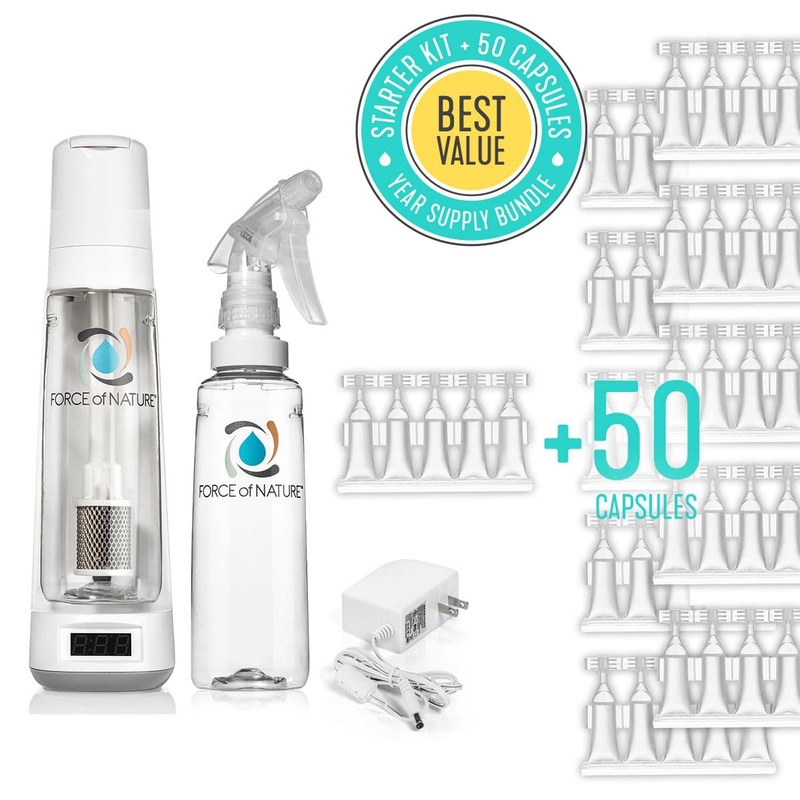 No special trips to a far away store to buy environmentally friendly cleaners. THANK YOU SO MUCH for offering a product that doesn’t have side affects and can actually stop you from getting sick. Quality product at a reasonable price and FAST, FAST, FAST DELIVERY!!!! I have NEVER purchased anything that has has come across my Instagram feed in an advertisement – until this. Actually it first came to my attention via the Skimm. I bought the starter pack I think – base, bottle, spray bottle, and 50 (plus5) activator capsules. The science made sense to me, I hate having multiple scents going at once (floor cleaner, tile and grout cleaner, bleach) and we have a rescue dog who likes to pee in the house! I was desperate to find a cleaning product that really works on dog urine – the dog was going to have to go. 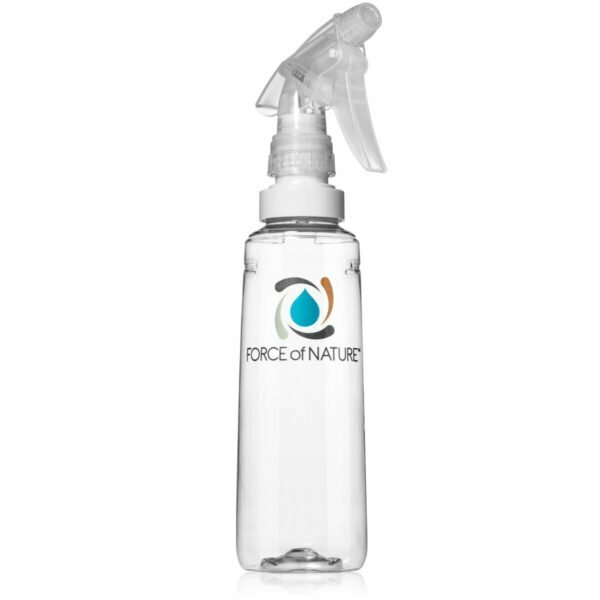 Force of Nature works as advertised – I am completely happy with its ease of use and its cleaning capabilities. The dog is still peeing in the house, but I can get it completely clean – with no odors left. How nice to be pleasantly surprised by an online purchase! 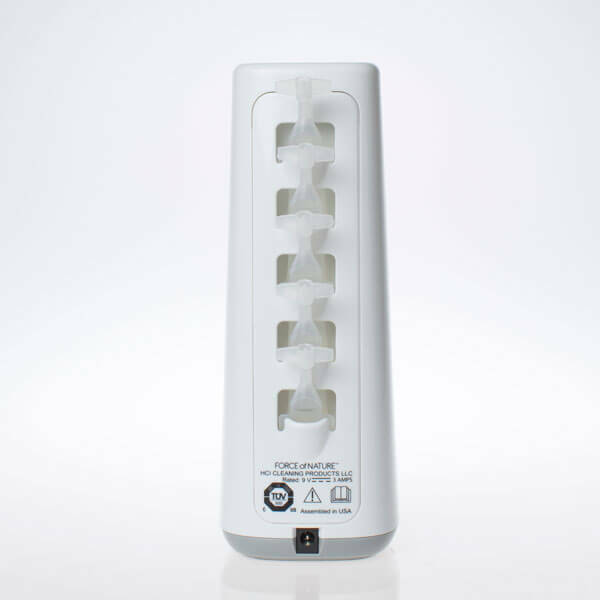 This is a great product! I have tried numerous ‘green’ and ‘natural’ products. Some I have liked but not like this. It cut thru the grease on my stove easily, the counters are cleaner and the initial smell is so fresh. The air feels cleaner. It worked very well on my tile floors. Cut thru the film that was left by a previous cleaner. My floors were mopped a couple days prior to receiving my FON but had to mop again as the film felt sticky. I was SHOCKED at how much dirt came off. One side of my mop was filthy and I flipped it over to see how much dirt was still there and the mop was clean. AMAZING product. I was disappointed in its ability to clean bathtubs/soap scum. It definitely does not work like scrubbing bubbles. You need an abrasive sponge and elbow grease. It also not really comparable to Windex, as there are a lot of streaks left behind. I do think it is great for carpet freshening tho. Hi – We have 2 key tips that will give you better results! On soap scum, if you have a lot of build up & surface porosity you will need a mild abrasive like a baking soda with scrub brush the first couple of times. The reason is soap scum builds up in layers so it can take a couple of applications to remove them. On glass (& stainless steel), because it doesn’t contain drying accelerants like ammonia or alcohol based products, the trick is to spray then wipe the surface until it’s 100% dry with a clean dry cloth or paper towel. We hope these help & we really appreciate your giving Force of Nature a try! Love this product. Saw it first on the show Cronicle. I am a Child care Provider and saw that a Child Care Center was using it thru the winter and reported a 50% reduction in illness. 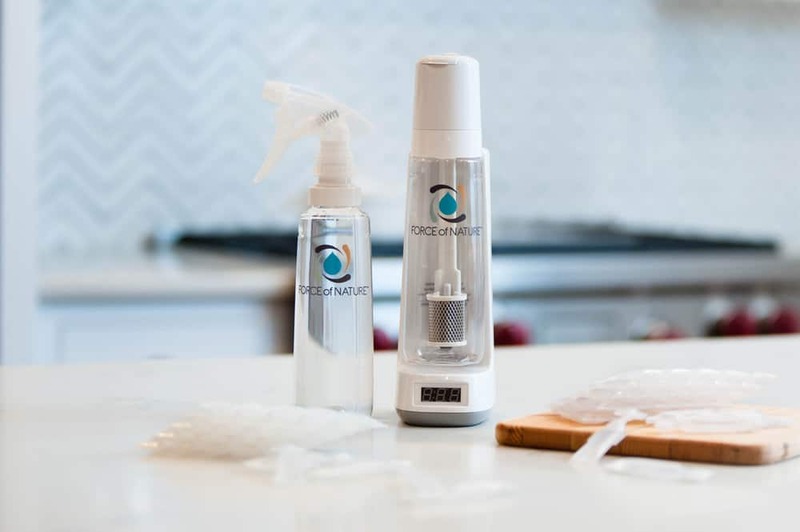 It works to kill the germs we need to eliminate without the harmful effects of other cleaning products. I ordered the 1 year supply and an extra spray bottle. I was so impressed with its cleaning ability. Everything shines without leaving a residue or strong smell. 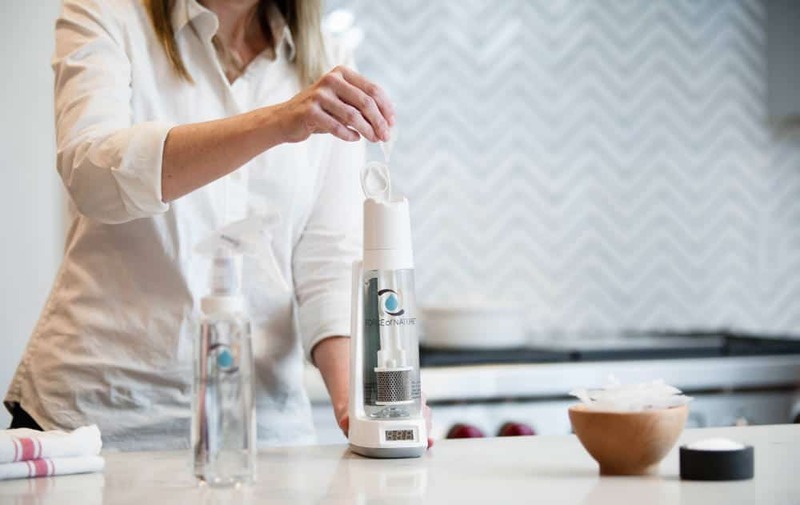 The smell is just a clean crisp order, and i can use this with confidence that it is cleaning without adding pollutants to the air and surfaces to which the children are exposed to daily. This is such a great product. I’ve had it just a few days and have been through 4 bottles already. I used a lot on my shower. I discovered if I spray it enough, I don’t have to scrub it. FON lifted the soap scum and now I spray the shower every day after use. I clean everything else with it, too. The scent is a light clean smell. The only change I would make is a larger spray bottle. I would not, however, want to have to pay for another, larger activator. 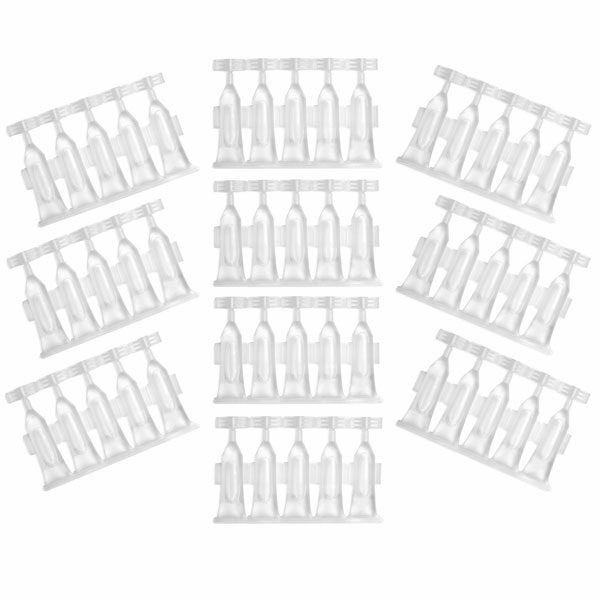 So maybe a bottle that holds 2 batches would be great. 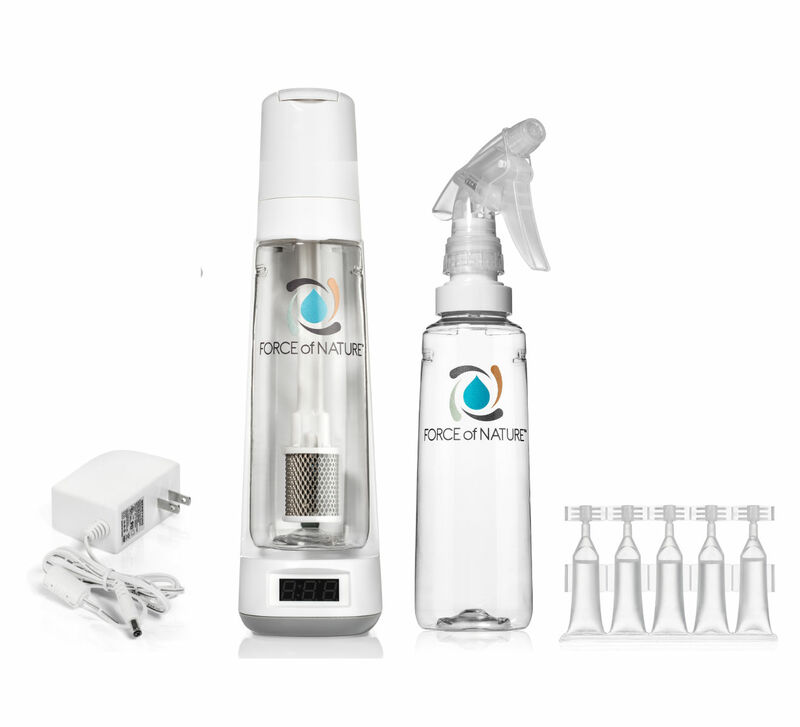 I have ordered a second spray bottle and additional capsules. I love this! No residue, disinfects and deodorizes. I even use it on my breast milk pump parts with lots of little nooks for stuff to get stuck in. Thank you!